Mercurial country Pakistan. Despite the exile from playing tests on their own soil, the match-fixing scandals, the constant upheaval, they keep unearthing match winning bowlers. The latest are Wahab Riaz, whose blistering spell on the third morning effectively reduced England from 204-3 to 242 all out – leaving them hanging precariously thereafter – and the leg spinner Yasir Shah (now on 69 wickets after 11 tests.) They, more than anything, represent the problem England have to overcome to level the series. Though winning the toss might come in handy. Wicket-taking is intrinsic to Pakistanis. They learn the hard way. When I last visited the country at the end of the 1990s, every concrete paddock and dusty open space was littered with cricket matches. Youths in shalwar-kameezs tore into bowl, hair and shirt tails flapping, hurling down a ‘tape’ ball (a bald tennis ball wrapped in gaffer tape) with lithe, athletic actions at exuberant batsmen. The surfaces were easy to bat on so practically every delivery was either a vicious bouncer or a toe-crunching yorker. It is here where they acquire the art of reverse swing. The tape ball gets naturally scuffed on contact with the concrete, until one side gets quite ragged. Then it starts to swing like a boomerang. 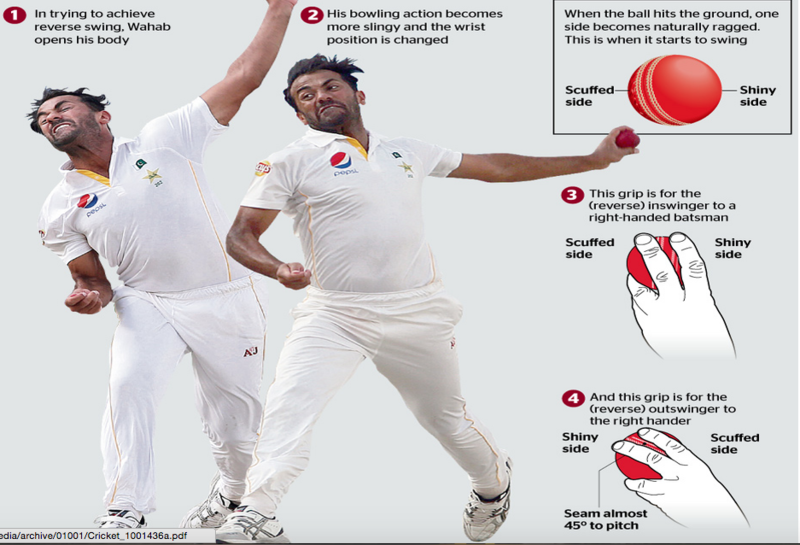 The bowlers open their actions slightly and drop their bowling arms to more of a sling and pull their wrists slightly down the side of the ball rather than keeping it behind the release. That accentuates the swing. (It is almost like a slice in golf – creating deliberate – or accidental – torque to make the ball curve more.) It is also important to bowl as fast as you possibly can. This was the principle behind Wahab’s bowling on Saturday morning. He was mainly spearing the ball across Joe Root (with reverse swing – the shiny side on the left) tempting him to chase balls with lots of protection on the offside, switching the shine round occasionally to bowl a straighter one or the odd sharp bouncer. His outswinger to Root is bowled with the seam almost at 45% to the pitch (rather than upright) so it whirrs down like a flying saucer. This not only exacerbates the swing but also further scuffs the leather on pitching (it lands to the side of the seam.) The ball that finally succored Root into a fatal waft swung a little more and beat him for pace too. The England door was ajar. Wahab then burst through it with a brilliant sequence of deliveries to the left handed Ben Stokes. First a couple of dangerous inswingers, and then, holding the ball more conventionally, seam upright with the shiny side on the right, several that went the other way. The one that he nicked to the keeper looked a poor shot but it went away from him late, and at pace, when he had expected it to come in. He crowned that with a superb full outswinger to the hapless Jos Buttler – angled in from round the wicket, then curving away – that had all the hallmarks of the great Wasim Akram. 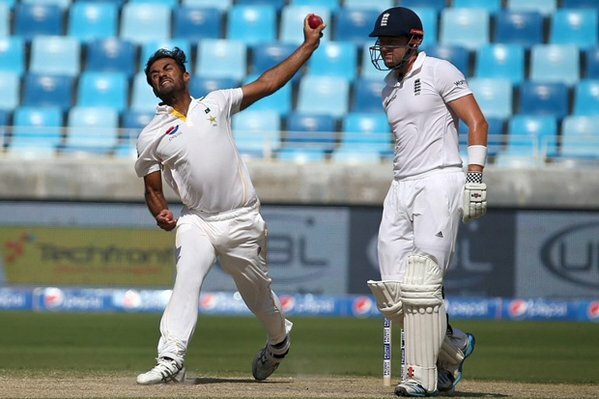 With his gliding run up and fluid action, Wahab sustained his 90mph pace through nine overs in oppressive heat. It was an incredible spell that blew a hole in England’s hull and they were slowly sinking from there on. It guaranteed that Pakistan remain the only unbeaten side in test series at ‘home’ since 2007. Expect more of the same in Sharjah. Previous story Wasim Akram: the fastest bowler I never saw.